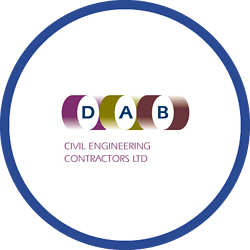 Founded in 2000 and based in East Midlands, DAB Civil Engineering delivers civil engineering contracts for commercial, industrial and retail sectors across the UK. The company boasts an extensive fleet of plant and equipment enabling them to undertake short and long term civil engineering and construction projects. At the time, management at DAB had little understanding of how their company vehicles were being used by employees commuting, or delivering equipment, to various sites across the country. They were especially keen to gauge the usage of these vehicles when they were taken home following jobs or kept by employees over weekends. Having greater visibility of journey movements would allow DAB to assess the levels of productivity during working hours and give them a greater insight in to the use of company vehicles for personal journeys. Following careful consideration of several tracking solutions, DAB Civil Engineering chose Crystal Ball’s FleetTracker solution based on its competitive pricing and the suitability of its functionality. In particular, FleetTracker can specifically report on fuel usage for vehicles outside working hours, while timesheets accurately record hours worked and journeys made during the working day. The System also reports on visited locations by the vehicles and includes the duration of time at each location. In addition, management can set up automated reminders for MOT and servicing dates through the Asset Management tool, which also contains insurance details and service history for each vehicle. DAB now has much greater control over the workforce than they had before with complete visibility of the fleet at all times – especially during weekend and evenings. This has resulted in a noticeable reduction of fuel costs and also fewer repairs and servicing bills for the fleet. “We have noticed considerable benefits on efficiency, and our fuel bills have come down somewhat since having the Crystal Ball system in place." In addition, management can now run reports which are used to support duration of time on site for engineers, plus journey details for deliveries – both of which contain accurate records that can be used to support billing to customers. FleetTracker’s reports are also used by DAB to support tax calculations for personal mileage submitted to the HMRC, reducing administration time and related costs.